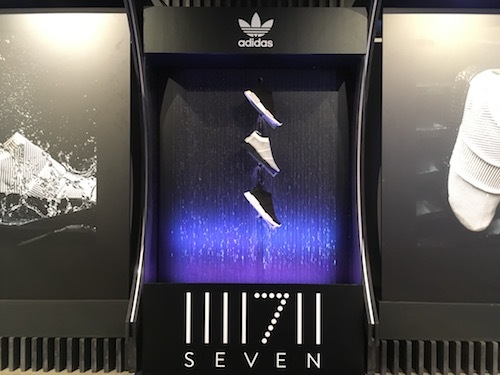 The Seven store in Liverpool hosted a promotional Adidas event for the launch of their latest trainer. The Primeknit style trainer conceals full GORE-TEX™ membrane linings, so that the shoe is completely waterproof despite its knitted appearance. 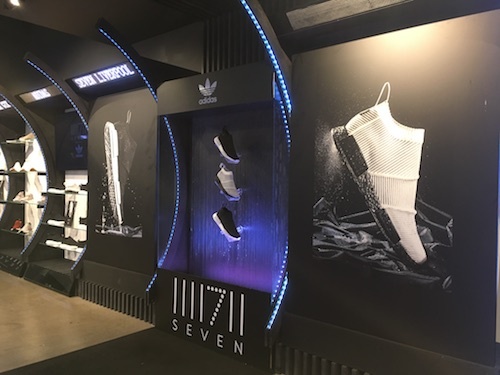 The whole store was transformed from a high-street shoe shop to an exclusive party venue complete with a live DJ, drinks, canapés and full Adidas branding. The centrepiece of the transformation were two displays stands for the trainers. These incorporated a Rain Curtain which attracted attention and highlighted the waterproof feature of the product. The store was due to operate a full days business so our team were not able to gain access to the store until 17:30 and the party was due to start just two hours later, in which time the total transformation had to take place, including the removal of all the stock. This meant that we wouldn’t have time to construct the product in-store, it would have to be pre-built and carried into the store in one piece. The challenge was made even more difficult by the fact we were not allowed to enter through the large front door, but instead had to deliver via the loading bay and a maze of corridors and lifts. We established the only way to get the product into the store pre-built would be to carry it in, on its side. Due to its weight it would be difficult to carry the distance from the loading bay so we build a small trolley which would aid the transit. This solution also required us to change the design of the product, to increase the structural strength of the side of the unit, as it would be laid on its side. We’d been provided access dimension by the venue but we built the unit slightly smaller so we had some room for error. This was lucky because we had only 2-3cm spare when we negotiated our way into the store – but we made it! The Rain Curtain unit lifted directly into place which just left us to fill it with water, position the trainers and plug it in. The event was a great success and a mere 3 hours later we returned to remove the product.